Penny For The Workhouse are a lively London based band creating quirky music with the style of Syd Barrett or early Bowie and swagger of old London Town. Formed in 2012, the band’s unique ‘Folk ‘n’ Roll’ style marries the energy of Indie rock with the captivating storytelling of Folk. With catchy lyrics and toe tapping drum beats, Penny For The Workhouse are bursting with personality, always making their audience feel part of their performance. Their self-released debut EP “Coins and Cards” (2012) was met with 5 star reviews on iTunes and also by Paul Weller, the Modfather himself! In 2014, the band’s follow up EP “Jack The Gun Slinger and Other Tales” was recorded at The Animal Farm in London. Along with a sold out successful launch night at The Camden Enterprise, tracks from the EP were picked up for radio play and the band also donated the title track “Jack The Gun Slinger, Country Singer” to feature alongside the likes of Noel Gallagher on The Pete Quaife Foundation Charity CD, “Legends; Shoulder to Shoulder”. Later in 2014, the band were lucky enough to support folk legends Slim Chance at Dingwalls, Camden, celebrating the release of Ronnie Lane’s Greatest Hits Album. As well as this, the band was asked to support P.P. Arnold who was playing for the Christmas Mod Ball at The 100 club in London. The Band have caused quite a stir on YouTube with their Punk cover of “Pick a Pocket” from the musical Oliver, by amassing nearly 10,000 views of the music video in just a couple of months thus collecting many new fans from across the globe. 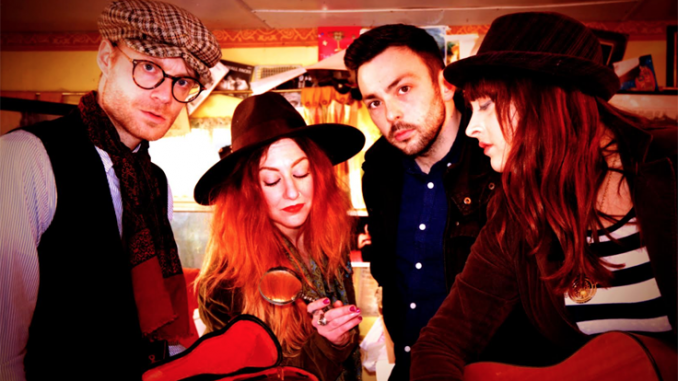 2015 has seen the band push forward with new material and have recorded their 3rd EP Live at SoundLab Studios, Essex and continued to gig throughout the UK showcasing their unique “Folk’n’Roll” style. Summer 2015 saw them perform at their first festival, Livestock Longdon in Gloucestershire alongside the likes of The Feeling, Scouting For Girls and The Hoosiers. The band continues to pick up new fans at every stop along the way, getting the world ready to start the Workhouse revolution!